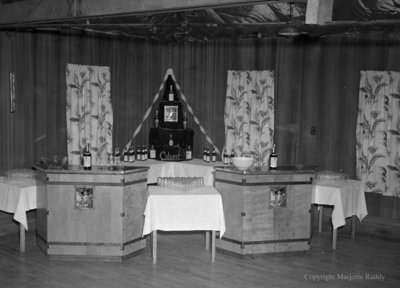 A black and white large format negative of the bar at Club Bayview. Club Bayview was a dance hall that was was built in 1946 by Harold Rowley. It was located on the west side of Byron Street north of Highway 401. The dance hall was destroyed by fire in 1965. Bar at Club Bayview, May 2, 1952, Marjorie Ruddy. Whitby Archives A2013_040_271.